Ne touches pas les rideaux! (Don't touch the curtains!) Those are the words that 82 year old Odette Saint will never forget. It's what her father, who had been a prisoner in Germany during World War I, told her when the Germans invaded Carentan, the rural town where Odette's family lived in 1940. She was nine years old. When I met Odette in Normandy last weekend, she said that the memory still haunts her. She shivered as she spoke of seeing the German soldier pointing his pistol at their second floor apartment window, the sheer curtains the only thing hiding her from his steely gaze. For the next four years, Odette and her family lived under German control. In her mind, she can still hear the ominous, rock-crushing sound made by the heavy leather boots worn by the invading troops as they marched down the narrow streets of her small town. The instructions that they shouted at Carentan's residents were incomprehensible. The French villagers didn't understand German and the soldiers didn't speak French. One of the first things that the Nazis did was seize the town's school. Curfews, blackouts and rationing were an integral part of Odette's childhood. Thanks to the fertile land in Normandy, Odette said that her family never went hungry like those who lived in the cities. The villagers of Carentan formed a close-knit community. When the local doctor, who was one of the few people allowed to travel from farm to farm, made his rounds, he would receive eggs or meat in return for his services. He shared them with Odette's family because her father was the mechanic who kept his car, which ran on an alternative source of energy produced by a gazogène system, in working order. When a couple of unfamiliar children took up residence with the family who lived across the street from the police station, the villagers kept quiet, even though they suspected that the children were Jews being harbored from the Nazis. At the beginning of June 1944, Carentan's inhabitants furtively discussed the news that they had heard on Radio Londres. The Allied forces were going to liberate France. After the US 101st Airborne Division successfully seized Carentan and the German army withdrew, Odette's father decided to take his family to Saint-Hilaire, a nearby village that wasn't as strategically important as Carentan because he feared that the Germans would return. On the way, they passed an American paratrooper lying dead next to the side of the road. Odette's father instructed his family not to look, but Odette couldn't pull her eyes away from the soldier's young face. She saw a Frenchman place a flower on the deadman's chest. Charles Stumpner rubs sand from Omaha Beach on John A. Daum's headstone to make his uncle's name more visible. Forever grateful to the American soldiers who gave their lives in exchange for her freedom, Odette continues this tradition today. 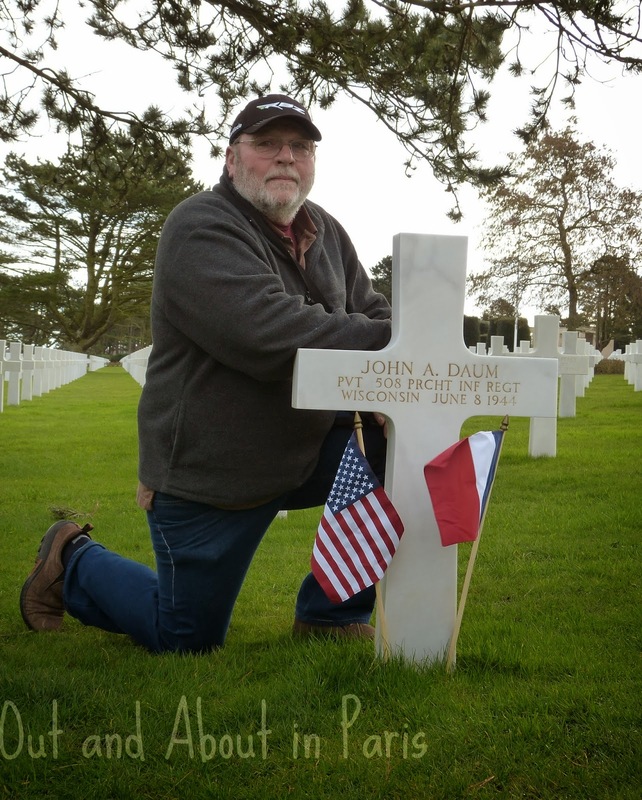 As a member of Les Fleurs de la Mémoire, an association that puts flowers on the tombs of the soldiers interred in the American Cemeteries of Colleville-sur-Mer and Saint James, Odette has adopted two graves. One of them belongs to Pvt. John A. Daum, a young paratrooper who died far from his family in a foreign land. It was through John's nephews from Wisconsin, Tom and Charles Stumpner, that I met Odette. Later that evening, while dining at the cozy wood-timbered John Steel Restaurant in Sainte-Mère-Eglise, Odette told us that she still knows all of the words to the "Star Spangled Banner". Her schoolteacher, who claimed that she couldn't sing when instructed to teach her students the anthem of Vichy France, taught the American national anthem to her students. Odette fondly recalls singing it for her liberators. June 6, 2014 will mark the 70th anniversary of the D-Day Invasion. 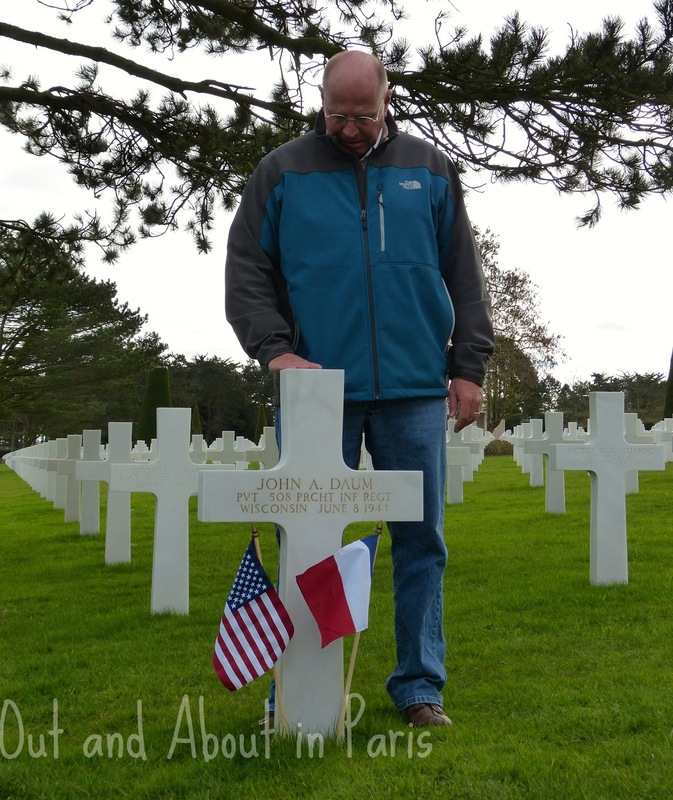 Charles Stumpner and Tom Stumpner next to their uncle's grave in American Cemetery in Colleville-sur-Mer, France. Odette is one of the most remarkable women I've ever met. When I asked if she holds any grudges towards the Germans, she explained that her town has a sister city in Germany and that she hosted a German student when they did an exchange. But she also said that she couldn't tell her father, who had been a prisoner in Germany during WWI, that there was a German guest in her home. She's truly inspirational. Yes, I'm still processing all of the emotions and impressions of our trip to Normandy. So touching, especially as my father's brother, who was killed in Normandy, is buried there. Do you know where your uncle is buried Susan? Has anyone in your family been able to visit his grave? If not, I hope that you're able to go some time. Visiting the American Cemetery in Colleville-sur-Mer is both emotional and peaceful at the same time. It's an experience that I wish everyone could have. very touching story!!!! Charles is my husbands uncle, so nice to see that he was able to go and visit and find more out about his past.